More than forty years later former All-Star pitcher Bill Lee still insists that the Boston Red Sox should have won the 1975 World Series against the Cincinnati Reds. “We were a better team than the Reds, we outscored them [30-29], and we outplayed them,” Bill says. 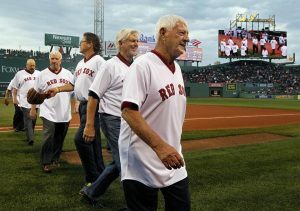 Lee, who was inducted into the Red Sox Hall of Fame in 2008, adds, “That 1975 Red Sox team was the best team I ever played on. The 1975 team had so much depth that we should have won it all,” Lee said during a February interview from his winter home near Fort Myers, FL. 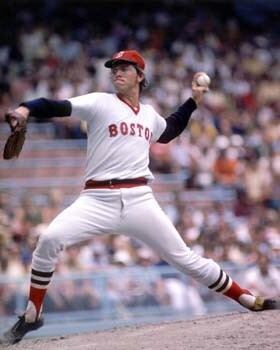 Bill Lee won 17 games for the 1975 Red Sox, the third straight season he had reached that level. And he pitched well in Games Two and Seven of the World Series, leaving with the Red Sox ahead in both games. During his ten seasons with the club he pitched in more games (321) than any other Red Sox left-hander, and his 94 career wins ranks third among southpaws. William Francis Lee III was born on December 28, 1946, in Burbank, CA. He graduated from Terra Linda High School in Rafael, CA, where he played baseball and basketball, in 1964. Lee says he owes his pitching career to his Aunt Annabel Lee, who pitched in the All-American Girls Professional Baseball League from 1944 through 1950. “She was the only other left-hander in the family so I learned my delivery from her. She taught me how to throw my big curveball and she taught me how to turn the ball over. Bill Lee was selected by the Boston Red Sox in the 22nd round of the June 1968 MLB Draft, behind about 500 other amateur prospects. One year later, after brief stops with three Red Sox minor league teams, he was pitching in the big leagues for the Red Sox. From 1969 through 1972, Bill Lee pitched in 125 games for the Red Sox, mainly in relief. Given a chance to start in 1973, he went 17-11 with an impressive 2.75 ERA. When he followed up with 17 wins in 1974, he became a mainstay of the pitching staff. 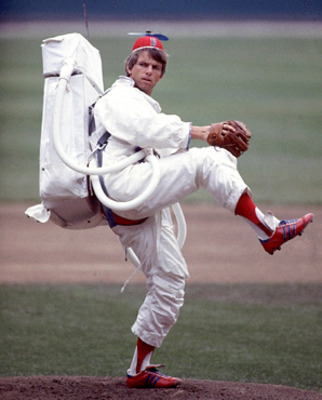 According to legend, Bill Lee was called “Spaceman” because of his non-traditional views on baseball and life in general. “Not so,” says Bill. “I had relieved Luis Tiant in the first inning of a game in Baltimore against the Orioles and pitched 8.1 innings of shutout ball. When spring training came to an end in early April 1975, the Red Sox were a consensus pick for third place in the AL East behind the Orioles and the Yankees. How did Bill Lee feel then about the Red Sox chances for the upcoming season? The Red Sox and Bill Lee got off to a slow start in April. The team ended the month in last place with a 7-9 record and Lee was a disappointing 1-3. But May was a different story. The club continued its strong play in June, highlighted by Fred Lynn’s three-home run performance against the Tigers on June 18. “Fred Lynn had as good a season in 1975 as any major leaguer I have ever seen,” Lee says. “He never looked like a rookie. Of course, some of that was the Rod Dedeaux influence,” he says, referring to Lynn’s three years at USC. At the All-Star break the Red Sox had a four-game lead in the AL East and Bill Lee had won ten games. How did he like the Red Sox chances at that point? One day that stands out for Bill Lee is a doubleheader against the Yankees in New York on July 27. “I pitched the first game and shut them out,” he recalls. “Fred Lynn made a great catch and we won 1-0. Then Moret shut them out for the win in the second game and they [the Yankees] fired their manager. “Sometimes I’ll meet fans who tell me they like the Yankees. I tell them I do too. I beat them 12 times and enjoyed every single one of them,” Bill laughs. On August 24, Bill Lee pitched his 16th complete game of the season, beating the Chicago White Sox 6-1, to improve his record to 17-7. Between May 1 and August 24, he had gone 16-4, with 13 complete games. He agrees that was the best stretch of his MLB career. Lee pitched masterfully for eight innings, limiting the Red to four hits and a single run in the fourth inning. He was poised to take the mound in the ninth inning with a 2-1 lead when the umpires called for a rain delay. The Red Sox returned to Boston trailing three-games-to-two with Bill Lee scheduled to pitch Game Six. Then it rained, and rained, and rained some more. After the three rainouts manager Darrell Johnson announced that Luis Tiant would start in Game Six and Bill Lee would pitch Game Seven if needed. Luis Tiant pitched valiantly in Game Six but he was relieved in the eighth inning with the Red Sox trailing 6-3. After Bernie Carbo hit his dramatic three-run homer in the eighth inning, Bill Lee headed for the trainer’s room to prepare for Game Seven. “I was lying on the trainers table when Fisk hit his home run but I got out to the dugout pretty fast,” he chuckles. Bill Lee shut-out the Reds through five innings and he entered the top of the sixth with a 3-0 lead. With a runner on first and one out Johnny Bench hit a perfect double play ball to shortstop Rick Burleson but second baseman Denny Doyle’s throw to first landed in the Red Sox dugout to keep the inning alive. Lee pitched into the seventh inning, leaving with the Red Sox clinging to a 3-2 lead. But the Reds tied the game in the seventh, and a single by Joe Morgan in the top of the ninth inning gave the Reds a 4-3 win and the World Championship. “Not getting the win in Game Seven and losing the World Series was by far my biggest disappointment in baseball,” Bill Lee says. 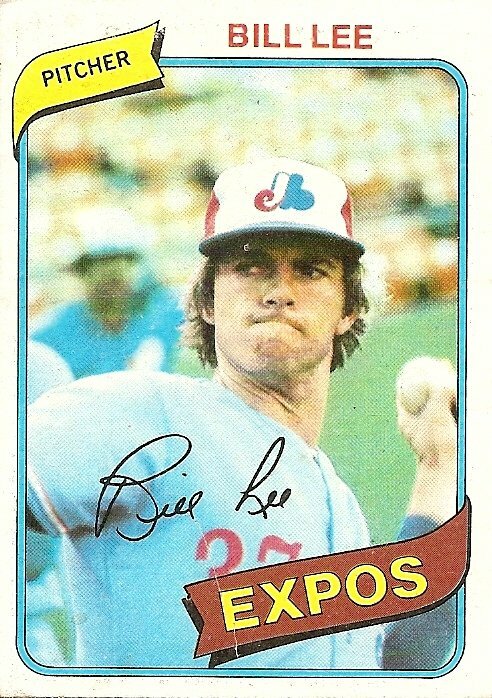 Not much went right for the Boston Red Sox or for Bill Lee in 1976. The defending American League Champions never found their groove and finished in third place, fourteen and one-half games behind the New York Yankees. Manager Darrell Johnson was fired after the All-Star break, and long-time Red Sox owner Tom Yawkey passed away on July 9. Bill Lee injured his shoulder in a brawl with the New York Yankees on May 20 that year. 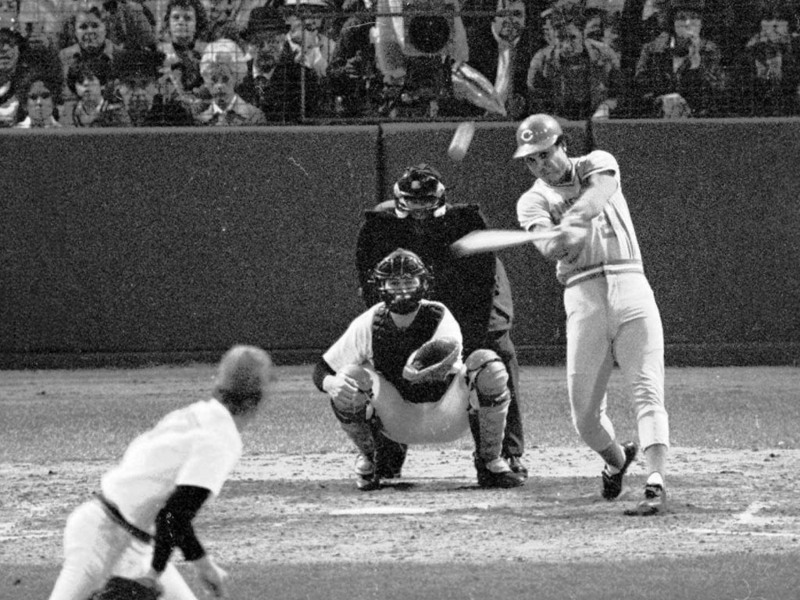 The fight followed a collision at home plate when Carlton Fisk successfully blocked the plate against Yankee outfielder Lou Pinella. In the scrum that followed Graig Nettles picked Lee up like a rag doll and tossed him to the ground. Bill ended up in the hospital with a severely damaged shoulder. Bill Lee finished the season with a record of 5-7, appearing in only 24 games. The 1977 season was somewhat better for Bill. He improved to 9-5, but he pitched only 128 innings in 27 games. The Red Sox and Bill Lee got off to a great start in 1978. By mid-June the Red Sox lead over the second-place Yankees was into double-digits, and Lee was sporting a record of 7-3. Things took a turn for the worse on June 16 when Lee learned that his great friend Bernie Carbo had been sold to the Indians. Lee ran his record to 10-3 on July 15, but manager Don Zimmer had lost confidence in the left-hander, and he was used in mop-up duty for the balance of the season. Bill Lee watched the heart-breaking playoff loss to the Yankees from the Red Sox bullpen. 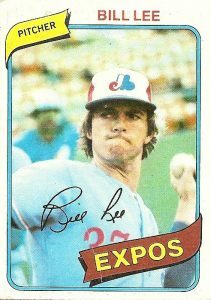 Lee spent the 1980 and 1981 seasons with the Expos, but in 1982 his season came to a premature end. After the Expos had released second baseman Rodney Scott, Bill staged a protest and General Manager John McHale called him in to give him his unconditional release. “I told McHale that the Expos would never win the World Series. And he told me that I would never play in the major leagues again.” They were both right. Bill Lee and his wife Dianah live most of the year in their home in Craftsbury VT, but they spend the winter months in the Fort Myers area. Bill has four grown children from previous marriages, Michael, Andrew, Kaitlan and Anna. And he is the proud grandfather of five grandsons and one granddaughter. Does Bill Lee have a message for current Red Sox fans? “Tell them to keep the faith. The 2016 Red Sox are going to make it worst-to first-to worst-to worst-to first. That’s a record that will be hard to break!” he says emphatically. Terrific piece Herb, thanks for writing and posting! Always liked Bill Lee, a Yankee Killer, for not just his professional spirit but his personal perspective as well. Bill Lee was and is a refreshing throwback to the old days when ballplayers were colorful and not bland, media managed, overpaid cardboard cutouts. Despite being branded by the brass as a ‘trouble-maker’ (and maybe he was, but it’s the same passion and personality that fueled his competitive spirit), he still loves the game with a purity of heart and purpose. And I didn’t know where his ‘Spaceman’ nickname really came from until just now. Well done — got to get back to sprinkling my cornflakes now.